Molecular dynamic simulation is a powerful method that monitors all variations in the atomic level in explicit solvent. By this method we can calculate many chemical and biochemical properties of large scale biological systems. In this work all-atom molecular dynamics simulation of polyalanine (PA) was investigated in the presence of 0.224, 0.448, 0.673, 0.897 and 1.122 M of guanidinium chloride (GdmCl) at 273-395 K by molecular dynamics simulation. Analysis of surface area, radial distribution function, radius of gyration, heat capacity, hydrogen bond, helix, coil and beta contents showed that an intermediate appears on the way of helix to coil transition. GdmCl at low concentration increases the midpoint of transition temperature (Tm), number of solvent molecules in the hydration layer and interapeptide hydrogen bond as well as decreases in rate of helix to coil transition. 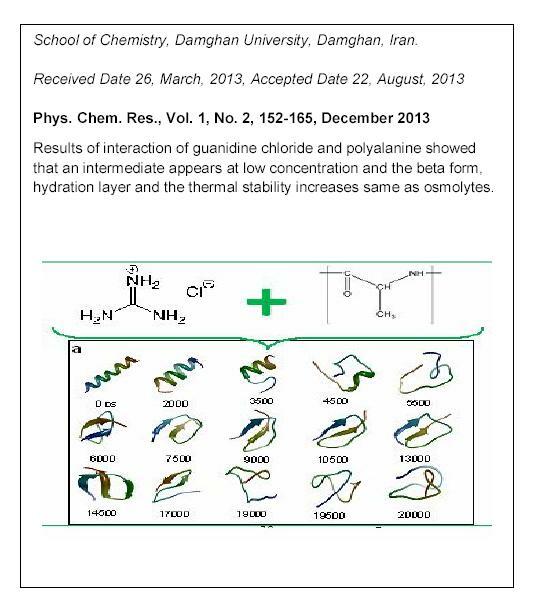 Thus, the role of guanidine at low concentration is same as osmolytes which decreases the beta form, increases hydration layer and the polypeptide thermal stability. B. Leitge, A. Kerényi, F. Bogár, G. Paragi, B. Penke, G. Rákhely, Mol. Model. 13 (2007) 1141. S. Yang, M. Cho, J. Phys. Chem. B. 111 (2007) 605. R.W. Carrell, D.A. Lomas, Lancet 350 (1997) 134. A.T. Sakkab, Y. Tasaki, L.C. Walker, T. Yasunaga, Y.Ye,. N. Zhuang, C.E. Augelli-Szafran, Bioorg. Med. Chem. Lett. 19 (2009) 654. F.-F. Liu, L. Ji, X.-Y. Dong, Y. Sun, J. Phys. Chem. B 113 (2009) 11320. D. Ajloo, A.A. Saboury, N. Haghi-Asli, G. Ataei-Jafarai, A.A. Moosavi-Movahedi, , M. Ahmadi, K.
Mahnam, S. Namaki, J. Enzym. Inhib. Med. Chem. 22 (2007) 395. A.A. Moosavi-Movahedi, S. Safarian, G.H. Hakimelahi, G. Ataei, D. Ajloo, S. Paojehpour, S. Riahi, M.F. Mousavi, S. Mardanyan, N. Soltani, A. Khalafi-Nezhad, H. Sharghi, H. Moghadamnia, A.A. Saboury, Nucleos. Nucleot. Nucl. 23 (2004) 613. D. Ajloo, A.A. Moosavi-Movahedi, G.H. Hakimelahi, A.A. Saboury, H. Gharibi, Colloids, Surfaces B, Biointerfaces 26 (2002) 185. A.K. Bordbar, A. Nasehzadeh, D. Ajloo, K. Omidiyan, H. Naghibi, M. Mehrabi, H. Khajehpour, M. Rezaei- Tavirani, A.A. Moosavi-Movahedi, Bull. Korean Chem. Soc. 23 (2002) 1073. M. Rezaei-Tavirani, A.A. Moosavi-Movahedi, S.Z. Moosavi-Nejad, J. Chamani, D. Ajloo, Thermochim. Acta 408 (2003) 9. P. Dasmeh, D. J. Searles, D. Ajloo, Denis J. Evans, and Stephen R. Williams, J. Chem. Phys. 131 (2009) 214503. X. W, G. Narsimhan, Molecular Simulation 35 (2009) 974. K. Bisetty, H.G. Kruger, J. J. Perez, Molecular Simulation 33 (2007) 1105. C. Niedermeier, K. Schulten, Molecular Simulation 8 (1992) 361. D. Ajloo, E. Taghizadeh, A.A. Saboury, E. Bazyari, K. Mahnam, Int. J. Biol. Macromol. 43 (2008) 151. I.A. Solov’yov, A.V. Yakubovich, A.V. Solov’yov, W. Greiner, Phys. Rev. E 51912 (2007) 1. I.K. Lednev, A.S. Karnoup, M.C. Sparrow, S.A. Asher, J. Am. Chem. Soc. 123 (2001) 2388. S. Williams, R.G. Thimothy P. Causgrove, K.S. Fang, R.H. Callender, W.H. Woodruff, R.B. Dyer, Biochemistry 35 (1996) 691. S. Yang, M. Cho, J. Phys. Chem. B 111 (2007) 605. A.V. Yakubovich, I.A. Solov’yov, A.V. Solov’yova, W. Greiner Eur. Phys. J. D 51 (2009) 25. O.V. de Oliveira, A.F. de Moura, L.C.G. Freitas, J. Mol. Struc.-Theochem. 808 (2007) 93. T. Arakawa, R. Bhat, S.N. Biochemistry 29 (1990) 1914. Y. Kita, T. Arakawa, T.Y. Lin, S.N. Timasheff, Biochemistry 33 (1994) 15178. J. Fitter, S. Haber-Pohlmeier, Biochemistry 43 (2004) 9589. L. Huaa, R. Zhoua, D. Thirumalaic, B. J. Bernea, Proc. Natl. Acad. Sci. USA 105 (2008) 16928. T.P.E. Mason, G.W. Neilson, C.E. Dempsey, A.C. Barnes, J.M. Cruickshank, Proc. Natl. Acad. Sci. 100 (2003) 4557. R.L. Baldwin, Biophys. J. 71 (1996) 2056. K.D. Collins, Proc. Natl. Acad. Sci. USA 92 (1995) 5553. Q. Zou, S.M. Habermann-Rottingaus, K.P. Murphy, Proteins 31 (1998) 107. A. Wang, D.W. Bolen, Biochemistry 36 (1997) 9101. J. Chugh, S. and R.V. Hosour, Arch. Biochem. Biophys. 481 (2009) 169. A. Zarrine-Afsar, A. Ittermaier, L. Kay, A. Davidson, Protein Sci. 15 (2006) 162. J.A. Schellman, Biophys. Chem. 96 (2002) 91. K.D. Collins, Methods 34 (2004) 300. L.M. Mayr, F.X. Schmid, Biochemistry 32 (1993) 7994. O.D. Monera, C.M. Kay, R.S. Hodges, Protein Sci. 3 (1994) 1984. G.I. Makhatadze, M.M. Lopez, J.M. Richardson, S.T. Thomas, Protein Sci. 7 (1998) 689. A.K. Bhuyan, Biochemistry 41 (2002) 13386. A.W. Schuttelkopf, D.M. van Aalten, Acta Crystallogr. D 60 (2004) 1355. W. Weber, P.H. Hunenberger, J.A. McCammon, J. Phys. Chem. B 104 (2000) 3668. R.E. Bruccoleri, M. Karplus, Biopolymers 29 (1990) 1847. J.L. Rosas-Trigueros, J. Correa-Basurto, C.G. Benítez- Cardoza, A. Protein Sci. 12 (2011) 2035. D. Van Der Spoel, E. Lindahl, B. Hess, G. Groenhof, A.E. Mark, H.J. Berendsen, Comput. Chem. 26 (2005) 1701. W.F. Van Gunsteren, S.R. Billeter, A.A Eising, P.H. Hunenberger, P. Kruger, A.E. Mark, W.R.P. Scott, I.G. Tironi, Biomolecular Simulation: The GROMOS96 Manual and User Guide, Zürich, Switzerland, Groningen, Holland, 1996. H.J.C. Berendsen, J.P.M. Postma, W.F. van Gunsteren, J. Hermans, in: B. Pullman (Ed. ), Interaction Models for Water in Relation to Protein Hydration. 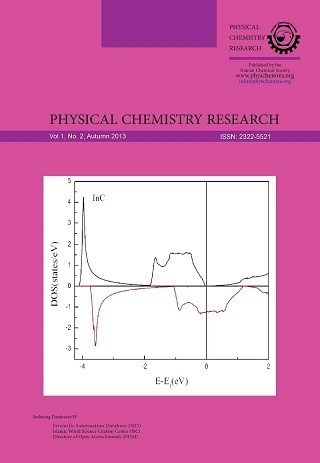 In Intermolecular Forces, Reidel: Dordecht, Holland, 1981, pp. 331-342. L. Verlet, Computer Phys. Rev. 159 (1967) 98. T. Darden, D. York, L. Pedersen, J. Chem. Phys. 98 (1993) 10089. B. Hess, H. Bekker, H.J.C. Berendsen, J.G.E.M. Fraaije, Comput. Chem. 18 (1997) 1463. S. Nosé, Mol. Phys. 52 (1984) 255. W.G. Hoover, Phys. Rev. A 31 (1985) 1695. M. Parrinello, A. Rahman, Phys. Rev. Lett. 45 (1980) 1196. L. Willard, A. Ranjan, H. Zhang, H. Monzavi, R.F. Boyko, B.D. Sykes, D.S. Wishart, Nucleic Acids Res. 31 (2003) 3316. J.I. Steinfeld, J.S. Francisco, W.L. Hase. Chemical Kinetics and Dynamics Printice-Hall International Edition, New Jersey, 1983. A.V. Persikov, J.A.M. Ramshaw, B. Brodsky, J. Biol. Chem. 280 (2005) 19343. K.A. Sharp, B. Madan, J. Phys. Chem. B 101 (1997) 4343.